Ghost World was released in 2001. In it, Johansson and Birch play Becky and Enid, respectively, best friends who have just graduated high school and, like typical teenagers, have no idea what they’re going to do with their lives . They are frank, misfitty, and catty (not in a Mean Girls kind of way, but in an alternative, we’re-social-outcasts-but-we’re-still-way-cooler-than-you-are kind of way). One day, as a prank, they decide to answer a personal ad that a lonely guy named Seymour (Buscemi) has placed. They pretend to be Seymour’s missed connection and tell him to come to a diner, where they secretly spy on him and, of course, make fun of him. But Enid actually feels sorry for Seymour and is oddly drawn to him, so she follows him home and befriends him. As the summer wears on, Enid continues to be weird and hang out with Seymour, while Becky starts getting into boys and clothes and mainstream teenage girl things. And, as often happens with high school friends, Becky and Enid quickly grow apart. Ghost World, the movie, is based on a short graphic novel of the same name. The movie was released only three years after the novel was published. And, in many ways, the movie is an excellent adaptation of the book. Enid is the weirder and more vocal of the two. Every few pages, she changes her style, dons new (and odd) accessories, or cuts her hair. Becky is slightly prettier and more conventional and remains fairly consistent throughout the book. She’s funny and bitchy, too, but she plays the sidekick. Steve Buscemi’s character, Seymour, appears to be a combination of two minor characters from the book: 1) Bob Skeetes, a weird astrologer whom Enid runs into several times and whom she describes as “this grisly, old con man . . . like Don Knotts with a homeless tan,” and 2) the author of a missed connection ad (“I saw you at Citizen Kane’s Sun. 21st. You looked over and we exchanged brief, unforgettable smile. You: stunning redhead, blue dress. Me: bearded windbreaker. Let’s meet for coffee/conversation.”) on whom Enid and Becky spy after prank calling him, pretending to be the redhead. Daniel Clowes, the author of the graphic novel, co-wrote the movie adaptation, so the vibe of the movie is very similar to that of the book: quirky, unique, and funny. The beginning of the book is amazing. Enid and Becky do a lot of sitting around, just people watching and generally being bitchy teenagers. Enid regularly lets loose with random asides like, “God, don’t you just love it when you see two really ugly people in love like that?” (accompanied by an appropriately awesome/mean drawing). One of the book’s strengths is the authenticity and hilarity of Enid and Becky’s conversations about nothing. The artwork (Drawings? Comics? Illustrations? I don’t know the appropriate graphic-novel lingo and a quick Google search didn’t provide a definitive answer) is impressive. In addition to black and white, seafoam green (see the example above) is the only color used. Nevertheless, the odd cast of characters (from the Satanists that Enid and Becky see buying Lunchables at the grocery store to the dorky waiter they call “Weird Al” at the ‘50s diner) are brought to life in all their bizarre glory. Clowes captures body language (posture, gestures, etc.) and facial expressions brilliantly. But, at only eighty pages, the book is pretty sparse. The movie adaptation was able to expand on and further develop some of the book’s themes and plot points in ways that improved the storyline. The book, by comparison, feels rushed and, as a result, the devolution of Becky’s and Enid’s friendship doesn’t make much sense. The pace of the book is consistent until about the last ten pages, at which point everything comes to a close in such a sudden and inconsistent manner that it makes you think to yourself, “Wait, what?” The end of the book would have benefited from at least a few more pages of transition to make the conclusion seem less abrupt. If not for those last ten pages, I would have given this at least a 4/5, if not a 4.5/5. Despite the ending, it’s worth reading. You can breeze through it in less than an hour. It’s a nice change of pace, it’s unlike anything else you’ve read this year, the dialogue is fantastic and authentic, and the comics are delightfully funny and incredibly well done. Also, if you haven’t seen the movie, you should watch that, too. Who should read it: Bryan and Sergio (i.e., fans of the movie—“Jaan Pehechaan Ho!”); Jake (i.e., movie lovers who would appreciate the art of the graphic novel format and would enjoy doing a book/movie comparison). 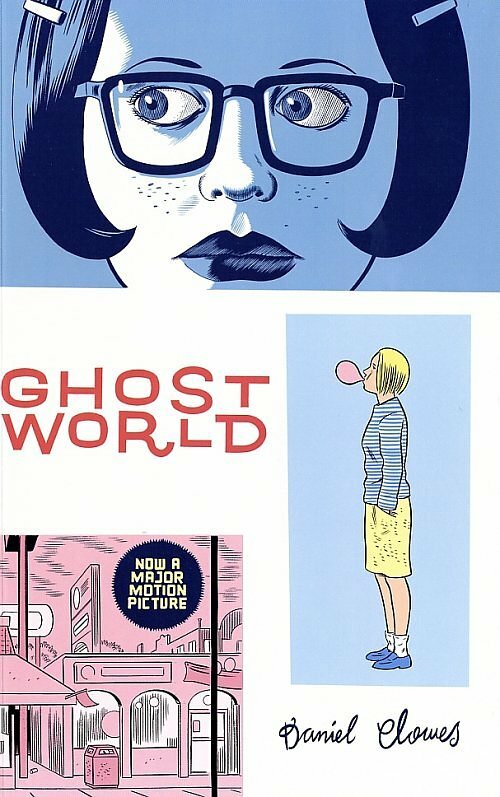 This entry was posted in Rating: 3.5/5 and tagged Book review, Book Reviews, Books, Daniel Clowes, Ghost World, graphic novel. Bookmark the permalink.